Triple H recognizes the greatness of Shinsuke Nakamura. Do you? Nakamura, an absolutely incredible wrestler whom you need to be watching if you aren’t already, will feature on the cover of a special edition of 2K17. And to promote the release, both WWE vice president (and former heavyweight champion) Triple H and Nakamura took part in a wide-ranging conference call to talk about Brock Lesnar, how amazing Nakamura is, and probably a few other things. The #WWE2K17 Collector's Edition is all about NXT this year! We didn’t bother remembering those, however, because all that matters is how awesome Nakamura is. As Triple H told reporters, the hypothetical future heavyweight champion (that’s right, we’re calling that one) is a must-see performer who can’t properly be described. It’s a bit of a copout to say words can’t do a person justice. In this case, however, Triple H is 100 percent correct. If somehow you’re a WWE fan who hasn’t seen Nakamura, you need to check out his match prior to WrestleMania 32 from earlier this year. It was easily the best in-ring work of the weekend. 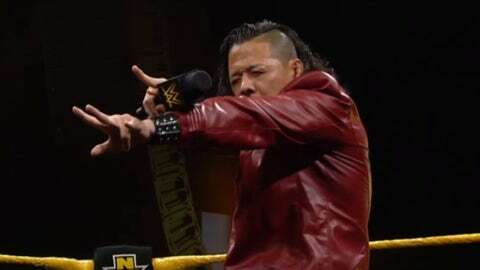 Everything Nakamura does oozes personality, from the flick of an eyebrow to the stunningly stiff delivery of his blows. Chemistry with his opponents is never a problem, because Nakamura is a one-man catalyst. He could wrestle a five-star match with a tree trunk — and probably figure out a way to put over the dead piece of wood. He was a maniac in New Japan Pro Wrestling; WWE made the wise decision not to water down his gimmick much, if at all, and it’s paying dividends.